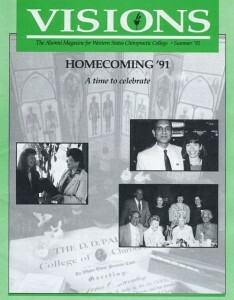 In January 1991, the college appeared again before the CCE. The college’s accreditation was reaffirmed for six years, however, the CCE issued a new concern that underscored the college’s need to address its “identity crisis” in an expedited manner. During their visit, the site team members met with various student constituencies to learn of their issues. The students’ perspective was included in the site team report and restated in the CCE’s letter to the college: “The Commission is concerned with the institution’s program objectives, when, as the team report has stated, the students feel a lack of confidence in their ability to help patients through chiropractic care.” In codifying their concern in writing, CCE was sending a message to the college that it must address the issue of institutional identity. In response to the CCE’s concern, the college undertook the difficult task of developing a new mission statement. Students, faculty, administration, alumni and board were invited to provide their input in crafting a mission statement proposal. The college was confident that this process would bring about consensus on an identity that reflected the values and principles the college had always embraced. It was the expressed wish of the board that a new mission statement define in unambiguous terms, the “brand” of chiropractic WSCC would represent and promote. As a matter of policy and procedure, chiropractic colleges’ mission statements must be reviewed and adopted by their respective governing boards. Considerable effort went into the draft submitted to the board for approval. Campus constituencies were pleased with the end product, primarily because consensus had been reached. Unfortunately, a number of trustees took exception to specific language used in the proposed statement and opposed its approval. During the board’s review of the proposed statement, the trustees were reminded of their responsibility to establish a clearly-articulated vision to guide the college. The trustees were told that simply opposing a new mission statement was unacceptable; they had to speak to their convictions and find consensus. They would not be allowed to abrogate their responsibility to establish a direction for the college to take. One trustee expressed fear that “unseen hands” had crafted the mission statement and it did not accurately reflect the brand of chiropractic he practiced. In response, another trustee insisted that each trustee address that central issue – what brand of chiropractic was WSCC to teach? a language change stating, “…joint somato-visceral and musculo-skeletal as part of the chiropractic health…” would be added to a different section. The additional language appeased the trustee, but it changed the entire thrust and meaning of what had been submitted from the campus community. In changing the proposed statement, the board resurrected an element of chiropractic that ran contrary to opinions held steadfastly by the campus community in general. “Chiropractic philosophy” and its associated dogma had been put back into the mission statement by the board. Confusion and contention about the “brand” of chiropractic offered at WSCC would continue. Early in the process of finding consensus on a new mission statement, the students elaborated on their many reasons for confusion. What they wanted were concrete answers to specific questions. Most of their questions centered on the differences between the fundamental philosophical approach to chiropractic and the less traditional, more contemporary evidenced-informed approach to chiropractic. Justifiably, students wanted clarification on a number of positions advocated by fellow students, faculty, alumni, administration and now, the board. Students had legitimate questions about their future role in the health-provision industry. Students simply wanted to be reassured that what they were buying with their tuition dollars was worth the investment. Not surprisingly, faculty, administration, alumni, and the board were struggling with the very same questions. Debate on this topic would consume the remainder of 1991 and much of 1992. Oddly, it would take the election of William Jefferson Clinton, in November 1992, to bring about clarity on the college’s identity crisis. March 1991 Commencement Exercise Program. June 1991 Commencement Exercise Program. September 1991 Commencement Exercise Program. December 1991 Commencement Exercise Program. Despite the distraction of the workers’ compensation fiasco and a raging debate about the college’s identity, other issues demanded attention. Although it is difficult to measure the damage done to the profession from the workers’ compensation crisis, there is no denying the consequences of all the negative publicity. Chiropractors across Oregon experienced significant downturns in new patient numbers. The college also felt the sting. Applications for admission dropped precipitously, with only 85 new students enrolling in the fall 1991 class. As it had on previous occasions when facing adversity, the college chose to advance rather than retreat. The college responded affirmatively to invitations to expand chiropractic services to other needy or under served populations through affiliations with the Salvation Army, the Portland Rescue Mission, and the Special Olympics Program. As a result of its commitment to provide no-cost care programs in the downtown area of Portland, the college was recognized by the larger health care community as a major contributor to the Multnomah County Healthcare Coalition. A rewarding symbiosis emerged where quality health care was provided to needy, appreciative patients by student interns engaged in an excellent clinical training experience. In fall 1991, Dr. Steven Oliver announced plans to resign as academic dean on July 1, 1992. Dr. Oliver had been a central figure during the most trying times at the college. His early role as director of the Student Health Center in the mid-1970s was instrumental in creating a clinical education program that prepared students for their outpatient experience and professional practice. Dr. Oliver’s tireless dedication to excellence in chiropractic education eventually catapulted him to the helm of the academic program as the college’s chief academic officer. But his loyalty had always been to the clinical training of students. He would remain at the college for years to come, but return to his preferred role as a clinic director, overseeing patient care and mentoring student interns. Students fortunate enough to experience his vast clinical expertise would never forget their encounters. This same year, Dr. Lorraine Ginter joined the college faculty. Initially, Dr. Ginter worked in the Student Health Center, overseeing the delivery of care to student-patients and instructing clinic labs where students learn the multitude of hands-on diagnostic and therapeutic procedures required for clinical practice. Eventually, she joined the clinic faculty at the campus clinic.